Skid steers and track loaders are machines that change with the seasons. One skilled operator (with the right attachment) can use these tool carriers for just about anything, depending on the time of year — putting new lawns in during the spring, drilling holes for trees in the summer or brush cutting decaying foliage in the fall. Come winter, contractors can adapt their loaders for plowing snow, loading it into trucks and even salting facilities. 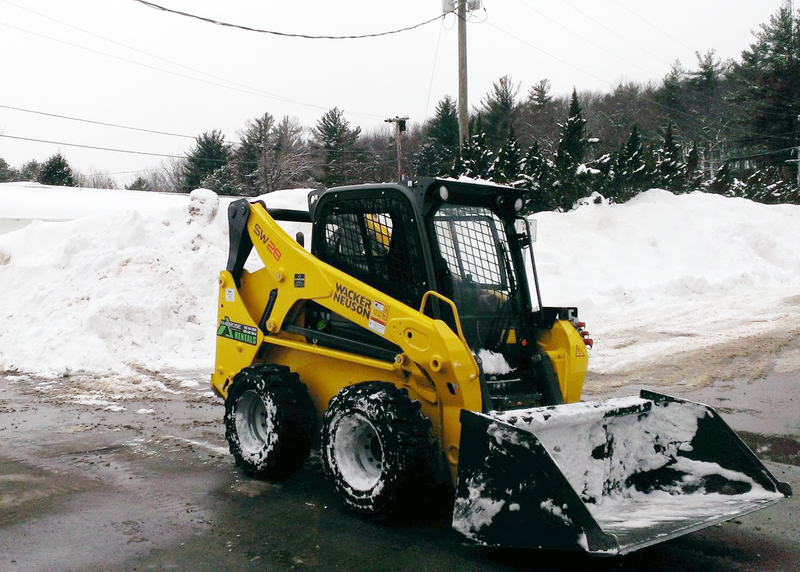 You can move more snow in eight hours with a skid steer loader than you can in 20 hours with a truck. There’s no need to back up or make Y-turns. You can just run circles around the competition. The use of snow blower, snowplow, broom or bucket attachments can turn a skid steer or track loader (basically a skid steer with tracks) into a nimble snow removing expert. Just be warned: Winter weather tasks can be tough on both the machine and implements. A skid steer and track loader must be properly prepared to work in snow-covered conditions, as it will be battling poor visibility, cold weather, long hours and icy, slippery surfaces. So first off: Which unit is better? Dedicated tracks or tires? Track Loader or Skid Steer? Because of its dedicated undercarriage, track loaders have exceptional tractive effort allowing them to push and turn well, making them a solid choice for snow removal applications. With track loaders, the operator doesn’t have to be as concerned with getting stuck or severely damaging landscaped areas due to the machine’s greater flotation characteristics. Track loaders seem like a no-brainer for snow removal, but that comes at a price. A big consideration for a track loader will be the type of track that will be used. If the track loader is equipped with a wide block-type track, it can easily break traction resulting in slippage and longer stopping distances, notes Caldwell. A track made specifically for winter applications will have a more aggressive lug pattern, providing better traction and resulting in reduced stopping distances and improved efficiency and performance. “If you plan on using a skid steer, be mindful of the tire pressure,” explains Caldwell. “As temperatures drop and the weather gets colder, tire pressure drops and should be checked regularly. As you lose tire pressure, the loader’s ability to lift to dump height and push material will be diminished. One thing a contractor can do to greatly improve the performance of his skid steer is to equip his machine with tires specifically for winter applications. The ideal tire for snow removal is generally a narrow tire — approximately 6 ½ in. to perhaps 8 in. wide — increasing ground pressure. Angle broom attachments are ideal for clearing sidewalks, small parking lots and driveways. Cold temperatures can certainly affect machines in different ways. To ensure equipment stays in peak operating condition, contractors should be winterizing their compact equipment as soon as the first fall leaves hit the ground. Some of the most important winter checkup items for skid steers or track loaders are the fluids, oils and fuels. If a loader doesn’t have the proper engine oil, engine coolant, hydraulic oil and fuel for operating in colder temperatures, then a contractor will find that the loader’s performance isn’t up to par. For example, it’s important to have lighter engine oil that matches the cold outside operating temperatures. As little as 2 in. of snow can create hazards on sidewalks, driveways, parking lots and other areas used for automobile travel and by pedestrians. Advanced planning is smart when considering the best attachments for your snow-removal needs, and there are several attachment options for use with snow and compact loaders. Many compact equipment owners simply use the bucket that was purchased with their skid steer or compact track loader, but that’s not always the best option. Besides buckets, brooms, blades and snow blowers are the most popular snow implements. Angle broom attachments are ideal for clearing sidewalks, small parking lots and driveways. An angle broom attachment will work best for snow clearing operations when snow is very dry and not very deep. Unfortunately, if there are more than a few inches of snowfall to clear or if the snow is heavy and wet, it becomes too difficult for the angle broom to push all of the snow off the surface being cleared. A snow push attachment is designed to simply “push” and clear large volumes of snow without leaving windrows or allowing for snow to spill over the top. “The attachment is useless if you do not have a machine that is optimized for the application,” says Brent Coffey, product manager of loaders with Wacker Neuson. V-plow or -blade attachments can be used for snow clearing and removal as the blade can be adjusted in five different plowing configurations: 1) straight blade — this position can be used to back drag, remove windrows and performs as a general cleanup tool; 2) V-configuration — both blades on the attachment are pushed toward the rear of the machine, used to make a first pass during snow plowing; 3) scoop configuration — set with both blades pushed forward for use in trapping snow; and 4/5) left/right angle blade — setting the blade angle to the left or right allows the operator to widen an initial cut through the snow and continue pushing snow toward the edge of a worksite. Designed to tackle the toughest snowfall and accumulation, the snow blower can have the ability to throw snow as far as 40 ft from the operator while removing snow from finished surfaces. It’s one of many attachments that can be effective in the removal of snow, but only if the operator uses his or her attachment and tool carrier correctly.